This elephant is worked in continuous rounds, you don't have to join or turn! draw up a loop. Yarn over, draw through all 3 loops on hook. Rnd 1: Work 6 sc in first ch. Rnd 3: *2 sc in next sc, sc in next sc; rep from * around - 18 sc. Rnd 4: *2 sc in next sc, sc in next 2 sc; rep from * around - 24 sc. Rnd 5: *2 sc in next sc, sc in next 3 sc; rep from * around - 30 sc. Rnd 6: *2 sc in next sc, sc in next 4 sc; rep from * around - 36 sc. Rnd 7: *2 sc in next sc, sc in next 5 sc; rep from * around - 42 sc. Rnds 8-17: Sc in each sc around. Rnd 18: *Sc2tog, sc in next 5 sc; rep from * around - 36 sc. Rnd 19: *Sc2tog, sc in next 4 sc; rep from * around - 30 sc. Rnd 20: *Sc2tog, sc in next 3 sc; rep from * around - 24 sc. If you're using safety eyes, this is the time to attach them. Rnd 21: *Sc2tog, sc in next 2 sc; rep from * around - 18 sc. Rnd 22: *Sc2tog, sc in next sc; rep from * around - 12 sc. Rnds 23-41: Sc in each sc around. Now you've created a looong trunk compared to the body. Stuff the trunk lightly, and sew the end closed, or fold it up a bit. 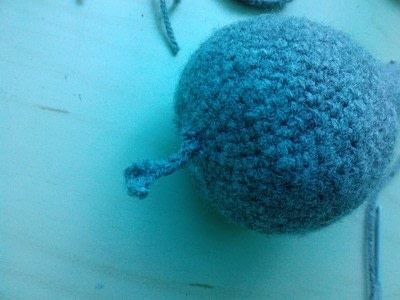 Finish:) But leave a long piece of yarn for sewing them closed and attaching them to the body. Do this thing twice, and then you have two cirkels. Rnds 3-5: Sc in each sc around. 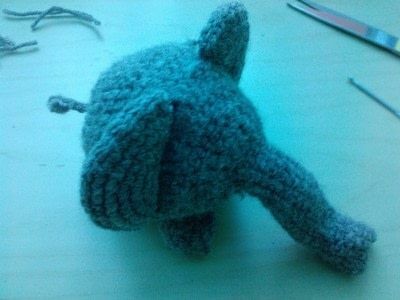 Finish:) But leave a long piece of yarn to the legs, for sewing them to the body. Now you have to make a tail. 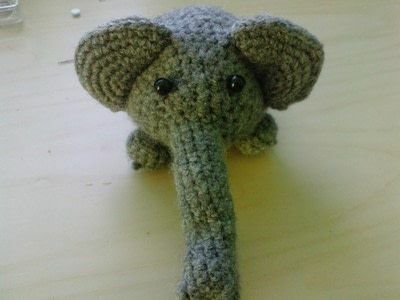 Join yarn at the back of the elephant with a slip stitch. Ch. 5, and work 3 hdc in 2nd ch from hook. I should look like this. 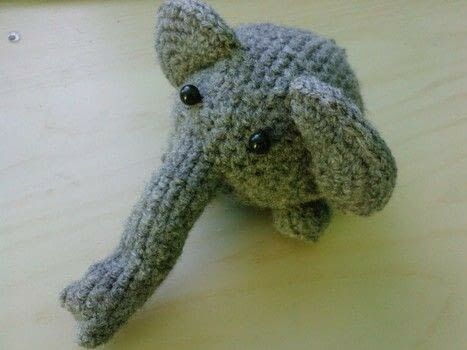 It's time for finishing the elephant. Fold the ears in half, stuff them lightly and sew them closed. Stuff the legs and sew them to the body, with the yarn you left on them. Sew the ears to the body, using the yarn you didn't cut off before. Cut off all the loose yarn, and make eyes with beads if you didn't do that with safety eyes.